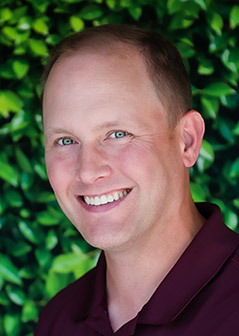 Dr. Lance Kovar is known throughout the community for providing compassionate and professional dental care to his patients. He has a gentle touch and thoroughly explains all treatment before beginning. Dr. Kovar is particularly skilled at calming dental phobic patients. He sets them at ease by listening to their concerns and providing reassurance that they can let go of their anxiety. With today’s advancements in painless dental techniques, his patients soon learn that a dental visit is nothing to fear. This commitment to patient care and comfort extends to every member of Dr. Kovar’s dental team. Everyone from the front office staff to the dental hygienists and assistants all work seamlessly together to deliver exceptional dental care to all patients. A lifelong Texan, Dr. Kovar grew up in Caldwell, TX. He and his wife, Heidi, have four children: Landon, Rylan, Madalyn, and Noah. As his family has grown, he has become increasingly active in fundraising and community activities for St. Mary’s Catholic School. He also sponsors and coaches some of their extracurricular activities, including baseball and softball. Dr. Kovar’s great passion is for his children. He strives to raise them to become thoughtful, active, and compassionate individuals. In his spare time, Dr. Kovar also enjoys outdoor activities such as camping, fishing, and hunting. Believing in giving back, Dr. Kovar has volunteered at the Good Samaritan Clinic since 2004. He works alongside other dental providers to provide quality dental care to patients that would otherwise be unable to afford care. He also works with Community Needs Council in assisting families and individuals obtain dental services.